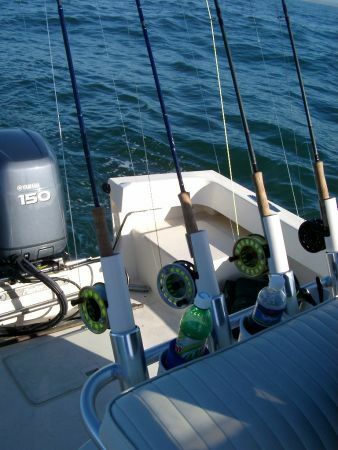 Anything that swims in the cold waters and Salt Water with a fly rod. Well bow season has finally arrived and my 12 year old son has been crazy waiting for this to happen. He has passed up a deer the last 2 season and this year he was what my buddy and I called 'River's Buck'. That is my son's name. The last several weeks my son has been monitioring trail cams and we had this deer patterned pretty good. My buddy was going to do the filming of the hunt and decided as much as I wanted to be there with my son. I would go on the other side of the property and sit in another stand and wait for the text. Everything is going good and I'm seeing some deer moving through randomly eating on acorns. A little after six my buddy text me and wants to know if I had moved River's cameras and was I seeing anything. I really didn't think much about it but did find it odd that the message wasn't about the kill shot. A few minutes later I decide to get things going and let an arrow fly at a nice doe. I'm thinking fresh backstraps and me and my son double on opening day. I don't wait long to pack up even though it is still early but I'm still thinking there is going to be a second deer. I go get mine and drag her down the ridge back to the 4wheeler and ease back down to the truck and wait. After an hour wait I hear the 4 wheeler coming from th other side of the property and know my son has not got his deer. When they pull up I can tell something is wrong. My son walks up and says my cameras are gone and someone has trashed the ridge. All the deer are gone. To make matters worst then my buddy says 'yah and I dropped my $3000 video camera off the tree mount and busted it all to Sh@$#. My son got these cameras for Christmas last year and this was his first season using his own stuff and not mine. HE had even gone to the trouble to chain them to the tree and lock them so they could not be opened. 2 locks per camera. At the time I was making fun of all the security. Not only was there the thief and broken video camera but the they discover when they got out of the stand and were looking around in the dark with lights that the thiefs had also put mouthballs all over the ridge where all the acorns are falling. Guess this is why no deer last night. So to the thiefs in Mill's River that stole and ruined my 12 year old's hunt and one of our better property's I want to commend you. We know most of the folks in the area and live here also. When I find you it will not be pretty. You probably consider yourself sportsman also......When I went up to check on my son before bed he said to me ' I guesss my seaason is over and it just started' He was totally commented to this deer and site. It about broke my heart. If anyone knows anything please contact me. I thought with bow season just a few days away I would share a funny video of my son a few years ago when he shot his first archery deer. It was just a doe but he made a great shot and she only went about 25 yards before pilling up. He has killed several since that day with a bow and is only 13 now. Hopefully everyone will experience some 'red bubbles' in the coming season. Stay safe and wear a safety harness if in a tree stand. 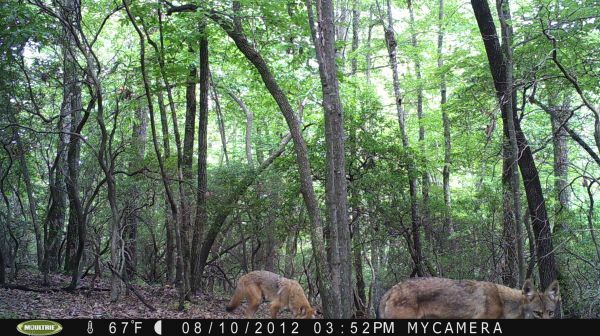 As much as I love deer hunting with my bow I would love for these to come by in three weeks so I could stick them. The yotes around here are putting a real hurt on the fawns. I got a picture of a fawn last week off one of my cameras that had a huge bite in its thigh. It was one of the lucky ones. My wife is a trail runner and she and the dogs find remains of fawns that the yotes have gotten way to often. To say it has been a tough year turkey hunting would be an understatement. I have been working real hard this season trying to get my son his first bird. He is very accomplished when it comes to deer hunting and has harvested severel deer with a bow but the ole TZom has eluded him for 4 years. We had lots of birds located back in March and early April and then they all disappeared. The last few weeks the only birds we could find were hens that seemed to be nested up already and no Gobblers talking. Friday I picked him up at school and told him I had a new place to go on a buddies property that had some birds. He was not sure he wanted to go and said yes I've heard that before. HE was getting very discouraged about turkey hunting to say the lease. We arrived at the property and were looking over one of the pastures when he said I see a bird down in the lower part coming out of the woods. I told I would get the stuff and and we would sneak through the woods and set up on it. Before I new what was going on he had grabbed his gun (not his bow)out of the truck and he took off through the woods circling the field without ole dad. About this time my buddy who owned the property came rolling in on his ATV to see what was going on. I told him the deal so we just stod by the fence and watched what happened. I grabbed my binos and found my son stalking through the woods towards the Gobbler who was still working the pasture. I'm thinking this is never going to happen and that bird is going to bust him. Ten more minutes go by and I'm still watching them both. My son gets mutch closer than I ever expected and I'm thinking damn he is close enough for a shot what is he waiting on. Then the bird starts acting nervous and I think it is about to be over when the bird starts to run. The next thing I hear is Boom when the Tom stops for a split second. My son runs from the woods and I had no idea at this point how close he had gotten. He starts jumping up and down and yelling I got him. We waited by the barn as my proud 12 year old comes walking back with his prize. The bird weighed 21.5 pounds had 1' spurs and a 11' beard. Not a bad first bird. Of couse my son said as soon as he calmed down I should have taken my bow. Saturday we were hanging out in my shop when my buddy called to replay the story from the previous day and he says you need to get over here. There is another good bird in the upper pasture that has been here all morning. I had several things on my to do list for the day but decided I would run over with my bow and calls and see. I got there with my son and the bird was gone. I got out of the truck and made some yelps. Nothing. After a few minutes I got out the gobbler call and made a loud thunder. I hear a bird respond over in the next valley. It was a long way off and on property we could not hunt. I set out a few decoys in the pasture and decided to see what would happen. I got set up and started calling every 10 minutes of so. The bird would answer each time but was not moving. After an hour it started moving our direction. He took his time but always responded to the call. After another thirty minutes he appeared on the edge of the woods on the opposite side from where we were set up. He slowly worked his way up the fence line and was looking at the decoys. He was getting close but he would not come out from behind the split rail fence. At 15 yards I was having a decision moment on what to do since the vitals were behind the bottom rail of the fence. I stepped out bow at full draw and when he stuck his heard straigh up I released my arrow between the two rails. The bird went nuts and I felt like I made a great sot but then the bird starts running wide open across the pasture and towards a steap wooded ridge. My son who had his bow makes a 80 yard hell mary shot at a running bird and his arrow misses by a foot. I decide to go back to the truck and get the gun and go after my bird. When I'm at the truck I realise my son is gone chasing the bird. I start over to where I last saw both of them and I hear my son up the mountian yelling for me. I climb the ridge and find him. I'm thinking this bird is gone and I did not make a good shot when my son says he has blood. I have never tracked a turkey by blood trail and still didn't know if I believed him. I get over to him and sure enough the leaves and rocks are sprayed with blood. We stay with the tracking for and hour and things are running dry and its getting late in the day. I look at my son and say I think this bird is gone. He must not be hurt to bad. We had covered over a mile of mountian at this point. I head back to the truck disappointed but my son is persistant and a great tracker. I tell OK but to get back to the truck in thirty minutes because we have a date with mom. I'm back at the truck and the time goes by and no son. I'm starting to get a bit worried and head back up th mountain to look for him when I look down the road and here he comes carry my bird. When he gets to the truck he is tired and hot and out of breath but with a big grin on face. 'I found your bird' 'They sure are tough'. I look at the bird and cannot get over its size or the damage my broadhead did The whole bottom of the troat was cut wide open and the windpipe cut clean throgh. The gapping whole was about 10'. I could not believe how far this bird traveled but did understand the blood trial. This was my best bird ever and with a great story. I will never doubt my son's ability in the woods again. 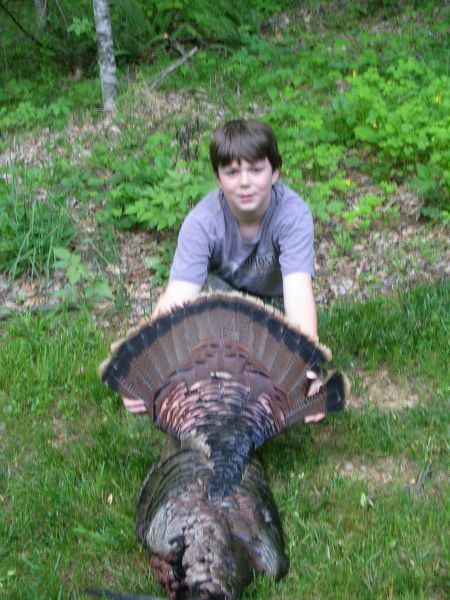 Teh bird weighed 24.5 pounds had 11.5' beard and 1 1/4' spurs. It also had the blueist head I have ever seen. It was a great weekend. Went to a 3D shoot on Sunday to round things out! Hey Guys, first time posting here but have been reading for awhile. I have been bow hunting for almost 30 years and have a question concerning the rut here in the western part of the state. I have always felt that the rut really doesn't get started in this part of the state till late November (After I'm back from Kansas and Kentucky). Usually by now the young bucks are showing sign of pre rut with small scrapes and horning trees. So far this year I have not seen or found any sign of this activity. Has anyone else in the mountians found any sign yet of pre rut activity? Maybe the moon this week will fire things up a bit. I've had the these brothers come in on me several times this fall. Hope they stick around till Spring. Not sure where you are located but like previously posted Fuquay Gun & Gold is a great shop. If in this area you might check out Perry's gun shop or Springhill Outfitters. All of these have great service and prices. I call on just about every major gun shop in the state. GT these are selling well for the dealers that have them so far. Only illegal in 3 states. NC, SC and VA they are legal. Movement is controled by the hunter with a pocket remote. $149.99 retail!!! A comment titled: loop in response to a report titled: Bowhunting/Archery Forum? Using that formula remember to subtract for a loop if using one with a release. about a 1/2 inch. A comment titled: youth WNC turkey in response to a report titled: Where in WNC can my son 'YOUTH' hunt for his first time? A comment titled: Great job in response to a report titled: My son's first buck Tues. evening!!! That is a great story. I would say with that many opps it was bound to happen. That is a great first deer! You guys will always remember this hunt. I know what you felt when he put this deer down. When my son killed his first deer which was a buck I think I was more excited than he was. He could hardly complete a sentence right after it happened he was so excited. Great job! A comment titled: Great job in response to a report titled: GT Finally knocks 1 out hunting in Rockingham Co. 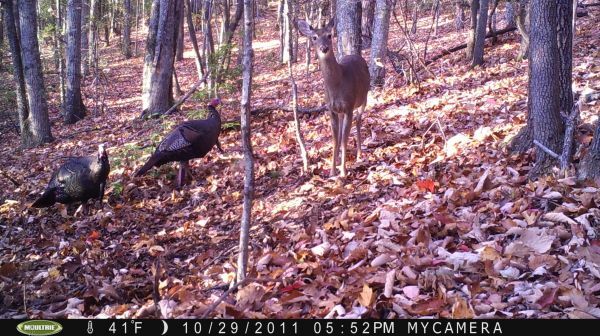 I would be surprised if it was one of ours that got stollen right before bow season but it was in WNC near the Buncombe/Henderson Co line. One was a M80 and the other was my sons Cuddy. Good luck and its great that you are trying to find the owner. Diane hang in there it will happen, great job on letting the young ones walk. It will pay off in a couple years. Way to get it done guys. I remeber when my son shot his first buck. It was something I will never forget. Memories like this is what it is all about. Great job getting your son outside and spending time together. You are correct. He has some character. Nice and tall. Good luck filling the freezer with some doe meat. Way to go Sarah on some good eats and great shooting. It's nice when you watch em drop. Diane sorry I have not replied sooner but I have been at sales meetings for the last 12 days up in Cleveland, Ohio. That is just awesome. I told you had nothing to worry about. I knew you could shoot and get the smackdown on one. Did you get this down at your Dad's or up here at home? The gobblers had better look out come spring time. You will be pinning a long beard to the ground. A comment titled: @ GT in response to a report titled: Lesson of the day! GT, for backcountry I use the silverbacks you mentioned with either muddy or leverage climbing sticks. They are light and quick to deploy. I also use 5 of the silverback XL when I plan on long sits in the tree. They have a larger platform and bigger seat for those all day sits. I also use the XL where I plan on leaving stands up for the season. The XL is still only 15#the so they are not heavy. Nice thing about gorillas is one strap for quick hangimg. I use my safty strap around the tree with a caribiner and my haul line to position the stand while attaching the strap. Keeps me from having to fight with the stand and gravity while standing on climbing stick with my linesmen belt. Hope this helps. Diane, so far it has been tough on everywhere here in our area. Have you got any oaks on the property that are dropping white acorns. If so they will be there right now. Stay with it and it will happen. Good luck next week down east! A comment titled: climber in response to a report titled: Lesson of the day! Which part of Kansas you hunting? My Uncle runs an outfitter business on his ranch. I've been going to Kansas for years. Awesome place to hunt and huge deer. I've already recieved pictures of some booners killed this week off the farm this week. Good luck to you brother.